Emily Johnson gets a congratulatory hug from Laura Damuth, director of National and International Fellowships, April 8. A meeting request from the chancellor turned into an educational opportunity for Husker Emily Johnson. Expecting to meet Chancellor Ronnie Green’s leadership team on April 8, the junior and president of the Association of Students of the University of Nebraska walked into Canfield Administration building and was greeted by exceptional news — she’d been selected as Dear old Nebraska U’s 17th Harry S. Truman scholar. 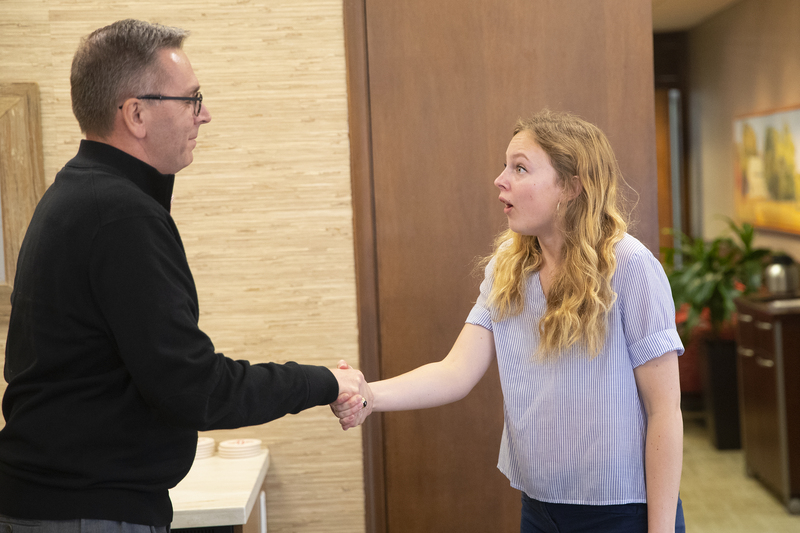 Emily Johnson (right) reacts with surprise as Chancellor Ronnie Green tells her she's been selected as a Harry S. Truman Scholar April 8. The Truman Scholarship is the living memorial to the United States’ 33rd president and was established in 1975. It provides aspiring public servants $30,000 for graduate education, along with opportunities for networking with alumni, specialized conferences and internships. It is awarded to only about 50 students each year and is the most competitive American fellowship to support graduate study and leadership development. This year’s applicant pool consisted of 840 students from 346 institutions. Johnson, a junior majoring in global studies, political science and Spanish, has made a name for herself on campus. Through her work with ASUN — first as internal vice president, now as president — Johnson has cultivated an expansion of mental health services at the University Health Center. She is also a member of the Honors Program; worked as a research assistant for Kevin Smith, chair of political science; and participated in a variety of service activities, including Dance Marathon and the Big Event. She’s also a volunteer in the Lincoln and Nebraska communities. At Lincoln Literacy, Johnson teaches a beginning citizenship class. Prior to that, she worked with English Language Learners at Everett Elementary School. She also served as a volunteer and intern for Jane Raybould’s senate campaign. But it has been her work at Lincoln Literacy, teaching Iraqi and Syrian refugees, that cemented her goal to pursue a career molding immigration policy for the United States. Johnson will graduate in May 2020, and is planning to take a gap year, during which she hopes to teach English abroad as a Fulbright Scholar and determine where she’d like to attend law school. Johnson admitted she never imagined attending college in her hometown. However, she said she could not have asked for a better undergraduate experience, especially in the support she’s received from faculty and staff. Those supports include working with Laura Damuth, director of national and international fellowships, to navigate the difficult process to earn the Truman Scholarship. “The faculty and administration here really want to work with students,” Johnson said. “I’ve heard from students at other Big Ten universities that they can’t get meetings with their vice chancellors, and I am on a first-name basis with our chancellor.